Karly Enger (right) with Education Professor Lucille Eckrich, one of Enger's favorite professors, at the 2016 Lavender Graduation Ceremony. Illinois State senior Karly Enger has been questioning the status quo and their own identity since they were a child. Yes, “their” and “they.” Enger, who identifies as queer, uses the pronouns they, their, and them. Enger, the co-president of ISU Pride, has spent the last four years fighting to make the University more inclusive and for the campus’ LGBTQ community. That activism was recognized April 3 when Enger was named the student recipient of Diversity Advocacy’s Commitment to Diversity Award. “It has been a blessing to work with someone like Karly,” said Danny Mathews ’11, M.S. ’13, ISU Pride advisor and Diversity Advocacy specialist. Mathews said Enger really understands how different social justice movements are related. One example was Enger’s outreach with ISU Pride to the Black Student Union. The latter group honored Enger with the Ms. BSU award earlier this school year. “I don’t really need to be acknowledged for the work that I do. But it is always nice to know that people are recognizing the actions you are taking,” Enger said. Enger’s advocacy for gay people began in middle school. Enger, whose uncle was gay, questioned their pastor about the church’s views on gays. “It just didn’t settle well with me, because I knew someone I loved very dearly was in that community. I just couldn’t be at peace with what the church was teaching me. I challenged them a lot,” Enger said. This past year, Enger has been challenging the campus community. 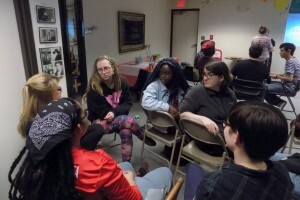 Enger helped organize ISU Pride’s Queertober, a series of public awareness events focused on the LGBTQ community, and spearhead its Color Me Queer campaign. Karly Enger has worked through ISU Pride to collaborate with other movements across campus. Enger has also pushed the University to open more gender-neutral bathrooms. During Transgender Day of Visibility, on March 31, ISU Pride placed the Transgender Pride flag outside Moulton Hall and got the Bone Student Center to create gender-neutral bathroom signs and open all of its first floor restrooms to both genders. This and other in-your-face activism caused some discomfort on campus, Enger said. Enger is set to graduate in May with an interdisciplinary degree in human education and services. Enger would like to work with developmentally disabled people—another community for which Enger has advocated—and continue being an activist.